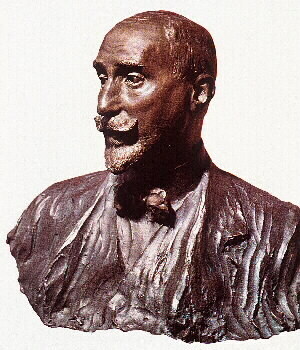 Illustrious politician, orator and Spanish jurist, born in Palma de Mallorca on May 2, 1853 and died in Torrelodones (Madrid) in 1925, who was Chairman of the conservative party and the Royal Spanish Academy of language. He moved to Madrid, where he/she studied law. In 1878 he/she married the younger sister of Germán Gamazo, one of the most prominent politicians of the Liberal Party. He/She began his political career in the hands of his brother-in-law. In 1881 he/she was elected Deputy for Palma de Mallorca, and is always on the line against Sagasta gamacista. In 1886 is Vice President of the Congress and, six years later, holds the post of Minister of overseas. Since his Ministry issued several decrees on the municipal administration of the Philippine Islands, and presented a bill for the Government and civil administration in Cuba and Puerto Rico, which is distributing powers between the central administration of the metropolis and the island Governments. Controversial discussions and great opposition which gave rise to his project, led to the resignation of Maura. In 1885 he/she returned to be part of Sagasta Cabinet, taking charge of grace and justice portfolios. The so-called "disaster of 1898" led him to adopt an attitude of censorship against the policy of restoration. He/She formulated his political doctrine, based on what he/she called "revolution from above", as a solution to avoid the development of a revolutionary process. It was imperative, according to Maura, reforms that were based on a radical morality, and were carried out by a Government that was capable of maintaining the principle of authority with power. After the death of Gamazo, it went on to lead the Liberal Party, until 1902, year in which he/she joined the conservative party. He/She was part of the Government of Silvela, as the portfolio of the Interior. And in 1903 became the Manager of the municipal elections. His determined intention to put an end to corruption, by the attack on the bases of the local chieftaincy, provoked strong opposition against him. This same year, Maura takes charge of the leadership of the conservative party, following the resignation of Silvela, and, in the month of December, is in charge of forming a Government. Then, from his new position, develops a project of administration with regionalist tendencies, with the objective of the catalan problem and put an end to electoral corruption. Your project and continuous differences with King Alfonso XIII procured him strong oppositions, so resigned at the end of December, 1904, year in which also was the subject of an attack in Barcelona. In 1907 it is called again to form a Government. It is the beginning of its most critical stage in the political world. Put into practice a comprehensive legislative reform that affected, especially, Electoral law and the law on strike. In foreign policy, made a great activity: the negotiation of the agreement of Cartagena, where Spain, France and England, recognize their common interest in the Mediterranean. Also reorganized the Navy, created great unpopularity among the shipbuilding sector. And he/she made strong campaigns against catalan terrorism. The crackdown, making his Government the "tragic week of Barcelona", in 1909, was the immediate reason that forced him to resign. The following year vuelvio to be new white terrorists in the city failed. In 1913, he/she resigned from his position as head of the conservative party. As of this moment, is clearly in the "great solo" and kept away from power for a long time. In 1918, it is already as head of the Maurista party, called by the King to preside over a Government of concentration, which failed. Subsequently, after the "disaster of Annual", in Morocco, on July 21, 1921, Maura returned access to power, taking care of the Ministry of war: their attempts to solve the mess in Morocco would be strongly contested by the military Juntas, which together with the poor results in their management, would again lead to his resignation. Away from politics, he/she died at his home in the Madrid town of Torrelodones, in 1925. Left us, in addition to its interesting reforms, a lot of speeches, speaking excellent fruit, among them: oratory as literary genre, civil liberty and political freedom, the campaign of Morocco, reply to the message of the Crown and the events of August before the Parliament.